On the field, 2015 was definitely one to forget for the Queensland Reds, winning just four games all season and only being prevented from the ignominy of finishing last in the Australian conference by the equally hapless Force. The rugby might not have gone too well, but there was one bright spark – the shirts. 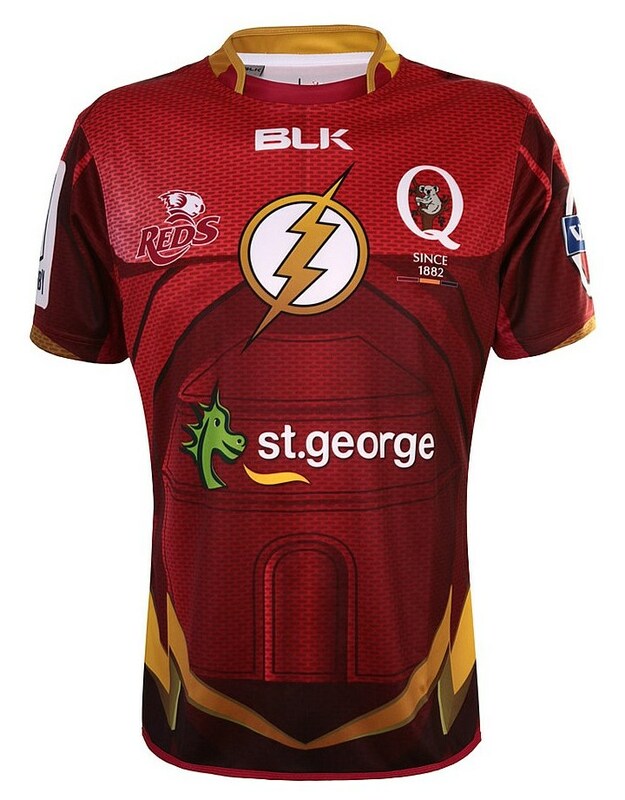 The Reds basic duds this season were very nice indeed, and they also wore a very cool Indigenous Round shirt. 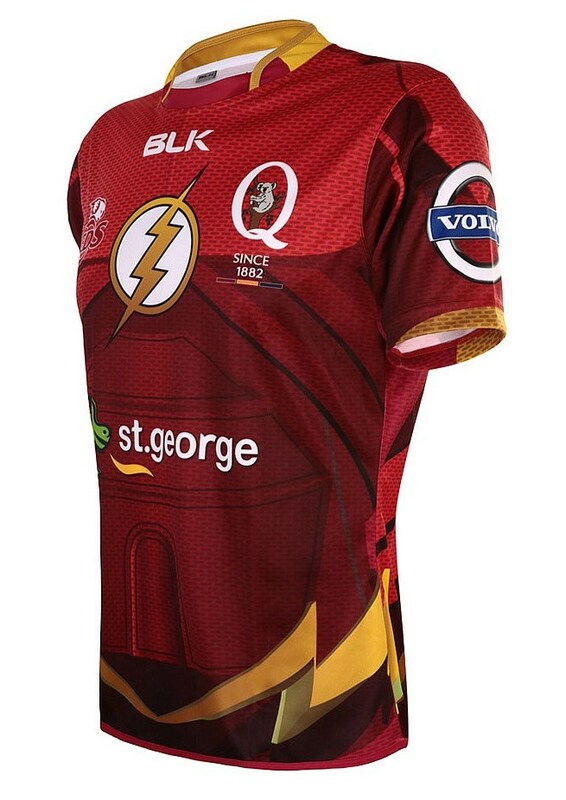 It’s fitting then that the Queenslanders finished off their season wearing perhaps the coolest one of the lot, their Superhero Round shirt inspired by The Flash. We were very excited when BLK brought the Superhero shirt concept over from the NRL to Super Rugby this season, and the first shirt of its kind, the Melbourne Rebels Superman jersey, was a worthy and entirely appropriate starting point. BLK was quick to follow up the Rebels design with this design based on DC’s Crimson Comet. And it’s hard not to look at it and smile. 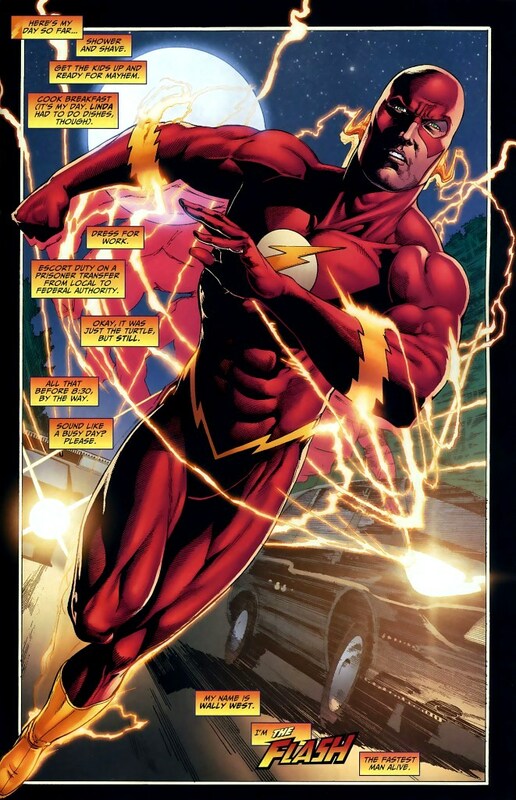 If any Super Rugby team’s colours were made for The Flash, it’s of course the Reds (similarly, put your money on BLK and The Sharks doing a Batman shirt next year!) 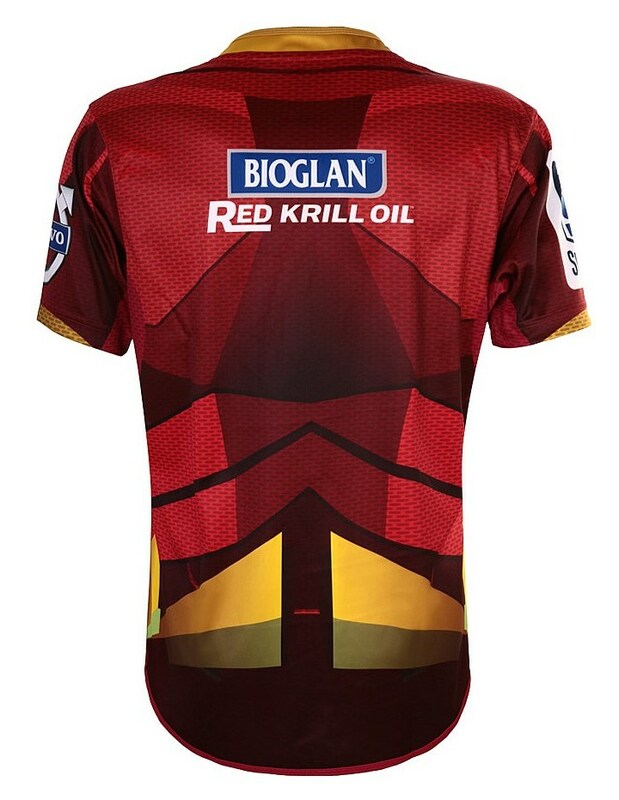 and we really like the way the design has incorporated the honeycomb pattern of the primary Reds shirt this season into the Flash design here. 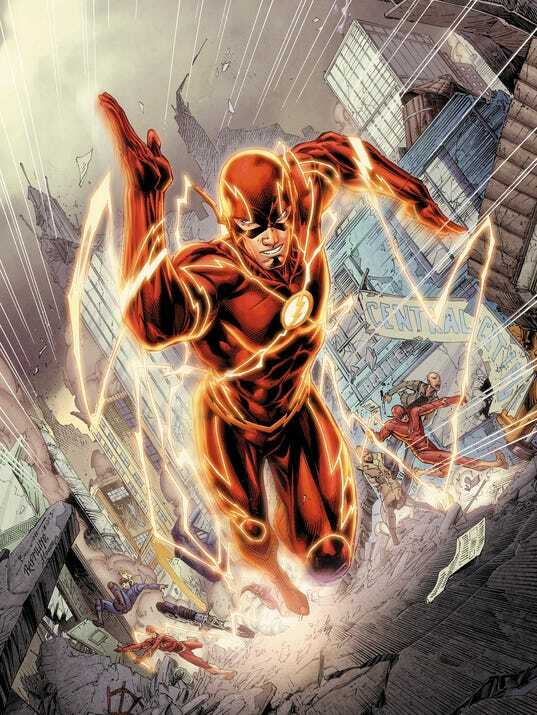 Judging by the slightly darker hue to the red and yellow here, combined with the vaguely armour-y looking design to the front and back of the shirt, we’re guessing this is more a take on the recent and wildly popular live action TV series Flash as opposed to the spandex-clad comics version. These super hero shirts are the best gifts a rugby loving comic book nerd could ever ask for, whether they’re NRL or Super Rugby, Marvel or DC. They’re also a fantastic way for teams that might not be drawing much attention for their electrifying play to attract young fans and casuals to the sport. There was some grumbling that the Reds wore a ‘gimmick’ shirt at the end of such a rough season, but we don’t see it like that at all. For starters this stuff was planned months in advance, and also, who cares? In such a bleak season, fans need something to smile about – and a shirt this cool is certainly raising a smile from us. stupid question, but these are sold out everywhere I look. Is there any chance more are going to be made/put up for sale to the public?